Your feet are the base for your entire body. Therefore, it is important to protect and support them during your lifetime. Diabetic shoes are specifically designed and constructed for foot protection, pressure relief and support. These shoes are designed with extra depth to accommodate prescribed inserts to ensure that your feet are protected and comfortable throughout the day. The 1993 Therapeutic Shoe Bill extends Medicare coverage to diabetic patients that qualify for a pair of shoes and several inserts every calendar year. Protective footwear can reduce complications of the foot and the number of diabetic amputations. Ask one of our pharmacy staff members for help in determining if you are eligible, and to schedule your personal fitting. 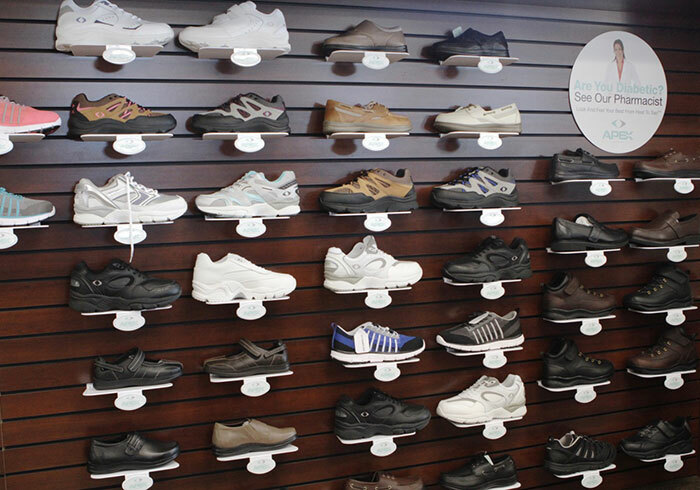 Orthopedic shoes are available at all of our locations!